Liquid Cooling System « Global Market Insights, Inc. The surging implementation of IT in several end-use sectors including banking, retail, and telecom is likely to fuel data center cooling market. Currently, data centers play a pivotal role in the functioning of several business enterprises, given that any failure in data center operations can have a rather negative impact on business growth. In fact, data center heat removal is one of the essential back strategies to maintain data centers. The growing priority for precise cooling and heat rejection facilities in order to collect unwanted heat from data centers is slated to stimulate data center cooling industry share. The ongoing innovations in cloud computing and data center platforms has also been favoring the growth of this business vertical. 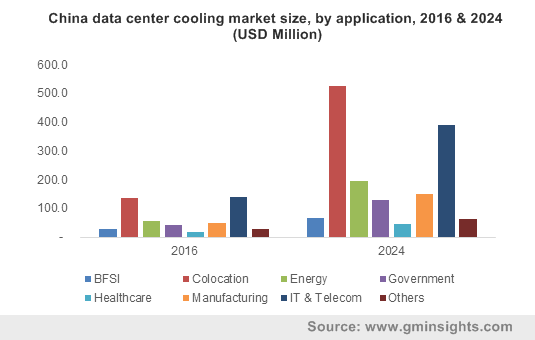 In addition, the emergence of IoT and artificial intelligence has also positively influenced the revenue potential of data center cooling market size, pegged at USD 8 billion in 2016. Data center cooling is one of the primary challenges ahead for data center users, owing to the adverse effects of excess heat and high temperature on the performance and lifespan of date centers. In order to enhance operational performance, many organizations are deploying more blade servers, which however results in high electricity requirement. The rise in electricity and cooling demand not only hampers the productivity of data centers but also increases the cooling costs. In this regard, several business enterprises are investing heavily in the development of efficient cooling and heat management facilities, which would considerably impact data center cooling industry trends. For instance, well-known internet giants Facebook and Google have declared an investment plan of USD 700 million to construct data centers in Iowa across U.S, which would help impel the commercialization scope of the regional data center cooling market. Thus, the rising number of investments in data center infrastructure development by leading tech behemoths is likely to influence data center cooling market outlook positively over the years ahead. Traditionally, in order to construct a new data center, nearly 35% of overall expenditure should be invested on cooling equipment. In fact, the increasing usage of emerging technologies such as Internet of things (IoT) and AI are fueling the requirement of powerful and larger data centers. In this regard, many of the giants in data center cooling market including Black Box Corporation, Schneider Electric SE, Rittal GmbH & Co. KG, Nortek Air Solutions, AdaptivCOOL, and Airedale International Air Conditioning are investing heavily in research and development activities to develop efficient and cost-effective cooling technology. As of now, most of the business organizations are primarily giving preference to liquid cooling systems, pertaining to its capability to consume lesser energy as compared to other systems. Some of the pointers supporting the deployment of these systems have been enumerated below. Reduction in required floor space: Liquid cooling system takes 50% to 75% less floor space, which may help to install a new data center within available space. Simplified infrastructure: Pertaining to the removal of components such as ducting, chillers, small PDUs and CPS, LCS’s simple infrastructure allows data centers to fit more IT facilities within the same space, thus augmenting data center cooling industry trends. Safety: Liquid cooling systems offer complete safety when used alongside electronic components. The robust growth in digitalization across the globe and the increasing demand for big data and cloud computing are likely to have a tremendous influence on data center cooling market. More importantly, increased application development and the fierce competition may help generate lucrative opportunities for data center cooling industry players, thus favoring the growth of the overall business vertical. This entry was posted in Electronics and Media and tagged Air Conditioner, BFSI, Chilling Unit, Colocation, Component, Consulting, Control System, Cooling Technique, Cooling Tower, Data Center Cooling Market, Data Center Cooling Market Share, Data Center Cooling Market Size, Economizer, Energy & Utility, Global Data Center Cooling Market, Healthcare, Installation & Deployment, IT & Telecom, Liquid Cooling System, Maintenance & Support, Rack Based, Retail, Room Based, Row Based, Service, Solution. This entry was posted in HVAC and Construction and tagged Air Conditioner, By Cooling Technique, Chilling Unit, Consulting, Control System, Cooling Tower, Data Center Cooling Market, Data Center Cooling Market Share, Data Center Cooling Market Size, Data Center Cooling Solutions Market, Data Center Cooling Systems Market, Economizer, Global Data Center Cooling Market, Installation & Deployment, Liquid Cooling System, Maintenance & Support, Rack Based, Room Based, Row Based.